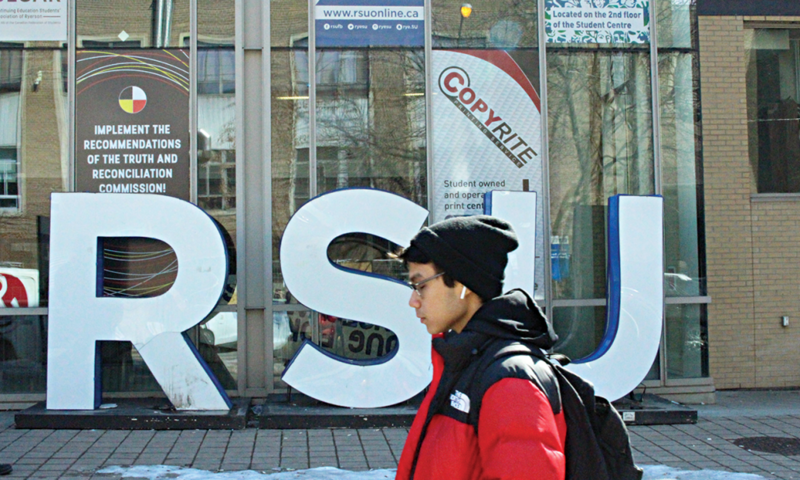 With the Ryerson Students’ Union (RSU) elections underway on campus, a survey conducted by the Ryerson School of Journalism suggests awareness about the RSU could be higher. It found that 40 per cent of Ryerson students don’t know what the union’s role is on campus, or what it does. RSU insiders say that lack of knowledge is a key reason why there aren’t large voter turnouts for student union elections. Historically, political engagement has been low at Ryerson. Last year, according to the RSU’s current president Maklane deWever, less than 15 per cent of eligible student voters participated in the RSU elections. Susanne Nyaga was the president of the RSU from 2017 to 2018. She ran for re-election last year, but lost to Ram Ganesh. Nyaga said that increasing voter turnout is difficult when the RSU may be seen as irrelevant to the lives of many students, especially if they don’t make a connection between what’s on campus and the union’s role in putting it there. On top of that, she said the RSU has struggled to be open and transparent with students over the years. “The RSU has done a lot for students on campus and it’s sad to see that reputation is slowly becoming tarnished,” she said. Bailey Kennedy, a fourth-year biomedical sciences student, said she doesn’t know what services the RSU provides for students or that elections are taking place this week, but she does know about the recent RSU credit card scandal. Kennedy is not alone. The survey found that 92.8 per cent of the students polled were aware of the controversy over the use of credit cards last month. In February, the RSU’s executive team was at the centre of a financial scandal that garnered local, provincial and national headlines. Publicly released credit card statements showed purchases racking up in the tens of thousands at nightclubs, LCBO and other non-union related activities. The RSU’s former president, Ganesh, was impeached on Feb. 11 in the wake of this controversy. The university is withholding most of its funds to the RSU until they complete an audit of their finances. Between her three part-time jobs, lectures, long labs, homework and commuting, keeping up with the RSU is not one of Kennedy’s priorities. “My main focus is school and trying to get out of here and find a good job,” she said. Neil Thomlinson, associate professor in the department of politics and public administration at Ryerson, said students are one of the most uninformed electorates, and that’s evident in Ryerson’s historically low voter turnout. However, he said that’s easily explained because students face many other pressures, making it easy for them to ignore their student government. “In fairness to the students, university life is hard enough, with too many things on the go all the time,” Thomlinson said. Each semester, Ryerson students pay an ancillary fee towards the RSU and other services. For the fall 2018 semester, the fee was $78.53 per student. This semester, it was $52.36, for an annual total of $130.89 per academic year. Funding goes towards running RSU services, like CopyRite, an advocacy co-ordinator for academic-related concerns and seven Equity Service Centres, as well as student groups and campaigns, such as one that barred bottled water from being sold on campus. The Ontario government wants to change policies and allow students to opt out of paying student levies at post-secondary institutes across the province. This includes the RSU levy, among others. Ontario Premier Doug Ford has used the RSU scandal to justify the new policy. Naomi Fox, a second-year social work student, said it hasn’t been explicitly explained to her what services the RSU provides. Most of the time, she’s focused on her classes. She said that information about the services the RSU provides could be more integrated into classrooms, and that the RSU could be doing more to raise awareness, but that part of the responsibility does fall on students.